Tomatoes: It's been about 3 weeks since they've been in the rooftop garden and they're doing great. They've completely shaken off their phosphorous deficiency and their stems and leaves are noticeably thicker and fuller. Lots of new leaves and a few flowers. Peas: These were direct sowed at the end of March. They're nice and healthy, about a 18 inches tall with a few flowers. Also, I no longer have to create supports for them to climb since they're using the reed fence to do so. Peppers: It's been just under 2 weeks since they were transplanted. New leaves are just starting to appear. The older leaves look a little wind battered, but other than that so far, so good. Eggplants: These were transplanted the same time as the tomatoes. They look great, their stems are thicker and the new leaf growth is much hardier to the elements than the older leaves, which are much paler and frailer in comparison. Cucumbers: They never sprouted! I direct sowed a bunch of seeds mid april, 3 weeks later when none of them sprouted I sowed a bunch more. Again, nothing. I'm assuming I got a bad batch and will wait till next year to try again. Broccoli: These were planted a week ago in my new DIY self watering container so they still look the same to me. I've been using the remaining part of the tote as a wind collar to great effect. No leaf shredding whatsoever! Update: Ooops! 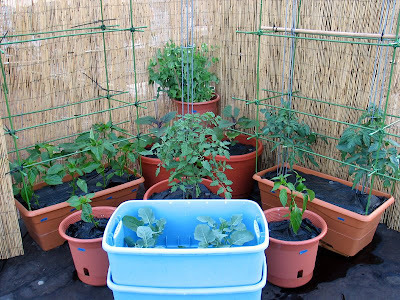 Forget to add an expense: 2 grow box staking kits. These are the green poles you see in the rectangular planters. Everything looks so healthy! I really like your tomato supports too. I may just steal the design. Hi Stacy, let's hope they stay that way! I bought the supports as a prepackaged kit, but they can be easily duplicated with a bunch of sticks, string and zip ties. Your container garden looks so neat!! And of course it looks every healthy as well. Hi Zach, thanks for stopping by. I checked out your blog and judging by your rooftop view I'd say we're very close neighbors. Do you shop at Mr. Kiwi's? I live about 3 blocks from there. I'm interested in seeing how the traditional vs. SIP battle turns out, can't wait to read more. Yep, right on the J train! Mr. Kiwi is our main supplier right now. Let's stay in touch and see how us and other rooftop gardeners can put our heads together!